Spider Fights – Philippine Blood Sport? Need some inspiration for underdark tavern games? Svirfeblin betting? Drow rebels taunting Lolth? Yes it’s a thing, and it’s included with The “blood Sports” category. File this under things that we had no idea existed, and will easily find its’ way into future adventures. 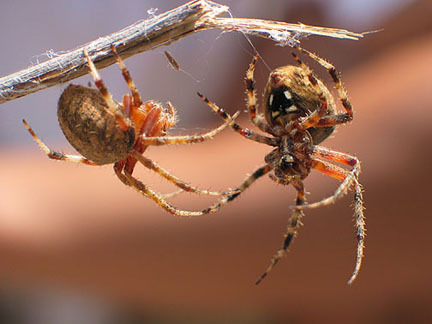 In the Philippines, spider fighting (Hiligaynon: pahibag sang damang; Cebuano: paaway kaka or sabong sa kaka) is staged between female orb-weavers from the genus Neoscona. In Japan, the contests occur at an annual festival and use females of the genus Argiope. In Japanese these contests are called Kumo Gassen (spider battles). In Singapore, they use males of the genus Thiania, and most commonly use the species Thiania bhamoensis, although another species of that genus may sometimes be used. Like cockfighting, spider fighting is a sport that usually involves betting and events occur frequently. In Singapore, they are known as “fighting spiders” in English and dòu zhī zhū (Chinese: 鬥蜘蛛, “fighting spiders”) in Mandarin Chinese, analogous to the Chinese term for gamecocks, dòu jī (Chinese: 鬥雞, “fighting chickens”). Honestly I personally don’t know how to feel about this. Yes people are urging animals to battle for their amusement, seems wrong doesn’t it? The fact that it’s spiders battling, softens the blow a little. In the end, I’m not going to pass any judgement, just looking at this strange thing I discovered while doing some research on my latest adventure module. The real world is stranger than we think, and inspiration for “dungeon dressing” is everywhere. Lolth would certainly find such ‘sport’ horrendous! Let the adventure begin! Might your heroes and good Paladins find themselves suddenly in agreement with and working for the Spider queen of the drow to stop a roving band of betting Svirneblin?